Oh hey, I read The Last Ringbearer once too. Man at Arms is always cool, but I hadn't seen that one before. Thanks for posting it chris. The beginning of this so reminded me of you Petty old fruit ! Seen on Facebook (yes, even though it's a tumblr screencap). I love that ! I would love that in my cosy little burrow of a flat ! Mashup of LOTR with the new Suicide Squad trailer. I don't always find this guy's mashups to be effective, but this one was pretty good. That was a pretty good bit of music! Some parts were especially effective. I won't say it is the "Hobbits to Isengard" of this trilogy, but pretty good! Eldorion wrote: Mashup of LOTR with the new Suicide Squad trailer. I don't always find this guy's mashups to be effective, but this one was pretty good. 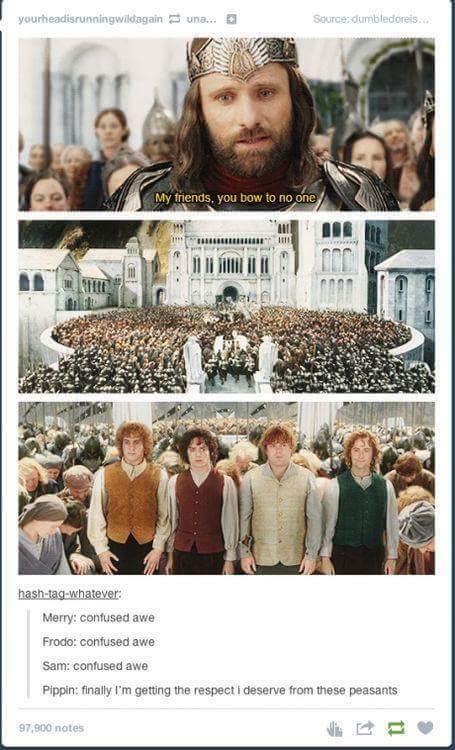 I love seeing LotR re-used in this manner. My favourite little bit was 1:58, great reaction shot there. Although I must say, the editor really blew it at one two points when it came to covering up the climaxes of the music with dialogue. The "to meEEEEEEE" really should have been allowed to ring out. Alright, the "you have no power here" one made me snort out loud. hmm...based on movies or original design? I rather like it. Lancebloke wrote: Where do I buy it?